Ready for the ultimate in convenient and comfortable dental care? We have everything you need to join our dental family. To make your visit shorter and more convenient, we proudly offer our new patient forms ready for download. This means you can fill in both forms at home before you come to the office. 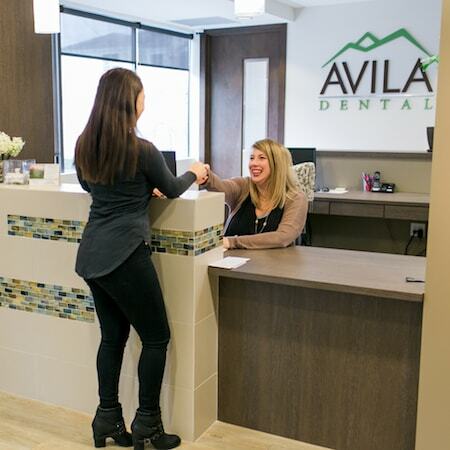 Feel welcomed and part of the Avila Dental family. Our friendly front desk team will greet you with a smile and look over your paperwork. Then you will enjoy a brief office tour to get used to your surroundings. Normally our skilled hygienist will give you an exam and take a few x-rays and pictures. You will be able to see them on the screen in front of you while each aspect is explained. Next, you sit down with Dr. Bello and discuss your concerns and goals. She performs a exam and provides options for your treatment plan. There is no pressure to commit to anything on the day, we simply provide our expert advice. After your exam, Angela will go through your financing and insurance options. If you are happy with everything, then we will book you for your next appointment. Book your appointment and fill in your paperwork in the comfort of your own home.